Ridinger, Johann Elias (Ulm 1698 – Augsburg 1767). This Stag of Odd 16. 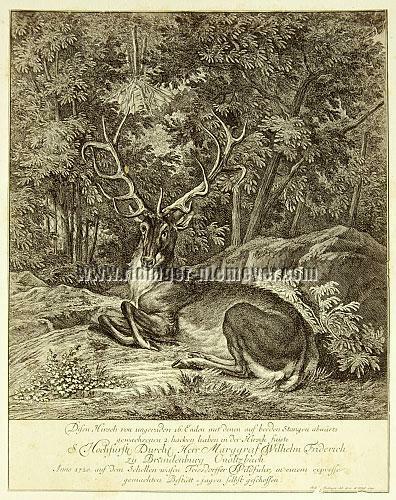 Points with those 2. hooks grown on both beams His High Princely Serene Highness Sir Margrave William Frederick of Brandenburg Ansbach has shot himself on the Schellen wasen of the Triesdorf Game Park in the deer fatness in the year 1720. Rolled-on photograph by Johann Laifle (ascertainable as active Regensburg 1865 – about 1900). (1865.) Inscribed: Joh. El. Ridinger del. et sc. et exc. 1741, otherwise in German as above & on the mounting carton: 12. / Photographirt von J. Laifle. / Verlag von A. Coppenrath in Regensburg. Size of photo 6½ × 5⅛ in (16.5 × 13.1 cm), of carton 12⅞ × 10 in (32.8 × 25.5 cm). and therewith bestows a collection enrichment of the most charming kind . Up to the spot on the wall ! Laifle’s late period documented here besides by a “Portrait Postcard System Laifle.” from 1899, by which individual portrait photographs were applied to Laifle’s landscape postcards. Laifle won medals at the World Exposition Vienna 1873 & 1876 in Munich.